My youngest DD (currently) likes penguins; she thinks they are cute. Some time ago (maybe last year, maybe before that .. I don't quite remember), I found a delightful piece of realistic penguin flannel. Since my daughters like to wear flannel bottoms and over-sized t-shirts for tops as jammies , I knew the penguin flannel would be perfect for a Christmas present. But, since relations with the aforementioned daughter can be somewhat prickly ... and I don't feel like rewarding bad behavior with presents .... the penguin flannel languished in my stash for at least two years. However, this Christmas things were going quite well; I rediscovered the flannel and made the jammie bottoms. 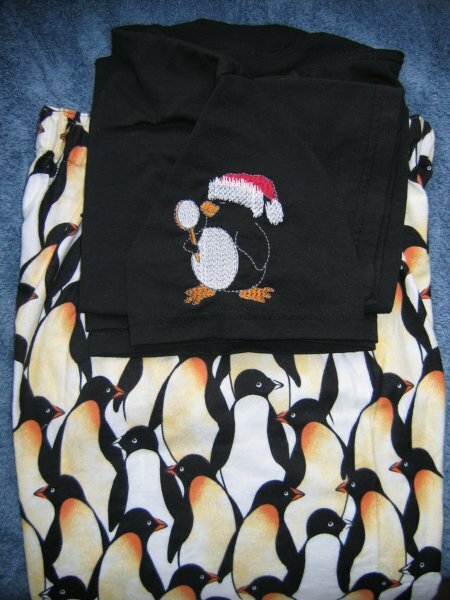 Since, by now, I also had an embroidery machine, I went searching for penguin designs to coordinate with the flannel. I found 3 wonderful penguins at Zaturn, a Dutch site. There is a menu on the left hand side of the page. At the bottom of this menu is a link "Winter". Click on that link to see all the Winter designs, among which are the 3 penguins. The body of the penguin is black and so is the t-shirt I was using for the top. I was concerned that the fully embroidered design would be too dense for the t-shirt and cause the embroidered area to curl up. So, I modified the design with Embird by removing the body embroidery entirely, leaving only the white areas & the gray outline stitching. I also modified the white "fur" on the stocking cap so it was more "fluffy" looking. I think the result came out nicely. I did the embroidery on the sleeve, which you can't see too well in the picture ... but it is on the sleeve!